This small yet rugged Blackhawk light carrier is designed to carry the smaller personal sized lights that are so popular with police, soldiers and civilians. The built-in tensioning device allows the use of different lights and keeps them in place and ready for use. The button recess at the bottom of the carrier prevents the accidental activation of light switches that protrude from the tail cap. This Blackhawk light carrier also has the same belt clip as thier magazine cases and can be removed from the belt clip and used on Blackhawks Dual Rail Accessory Platform for a combo carrier for light and pistol magazine or in combination with any of thier other accessories. 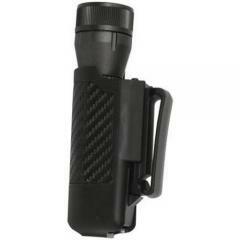 Will a Streamlight Protac Hl fit in this holder? Yes, it should fit the ProTac HL.